Given the huge resources involved in yearly vaccination campaigns, an urgent re-evaluation is needed, Tom Jefferson says in the British Medical Journal. Mr Jefferson said when he studied the data much of the work was flawed and he found little proof of the jab's merit. BMJ editor Fiona Godlee criticised the way the UK evaluated the merits and costs of jabs and called for change. The government's drugs watchdog, the National Institute for Health and Clinical Excellence (NICE), has already said it would be happy to take over this job. Ms Fiona Godlee said: "The problem is that the UK has no transparent process for evaluating the effectiveness or cost effectiveness of vaccines. "NICE would like to take this on. The government should let it." Currently, the Joint Committee on Vaccination and Immunisation (JCVI), an independent expert advisory committee first set up in 1963, does this. 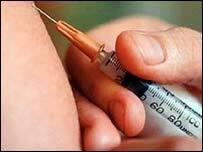 In the UK, experts say groups most at risk, such as the elderly, should get the vaccine during the flu season. But it is difficult for scientists to make the vaccine because the influenza viruses mutate and the strains circulating vary from year to year. This also makes it difficult for scientists to study the precise effects of vaccines, said Mr Jefferson, who works for the Cochrane Library - a body that determines the relative effectiveness of health interventions. He said the most reliable way to judge their effects was to use systematic reviews - impartial summaries of evidence from many different studies. But when he did this, he found flu vaccines had little or no effect on many influenza campaign objectives such as hospital stay, time off work, or death from influenza and its complications. Most studies were of poor quality and there was little evidence on vaccine safety. Mr Jefferson said: "There is a misfit between the evidence and policy, and tax payers ought to ask why." He said it was possible that some of the sickness labelled as flu was actually due to other infections, which would cloud the picture. This is compounded by a lack of accurate and fast surveillance systems that can tell what viruses are circulating in a setting or community within a short time frame. In the hurry to prevent sickness and deaths, vaccine campaigns begin before more precise information about the circulating virus is available, he said. "Given the huge resources involved, a re-evaluation should be urgently undertaken," he said. Last year's flu campaign cost £115 million. Dr David Salisbury, director of immunisation at the Department of Health, said evidence showed flu vaccines could give up to 80% protection from infection and prevented hospitalisations and deaths. He acknowledged that the vaccines were not perfect, but said: "We are hopeful that new vaccines currently in development may overcome some of the concerns raised about efficacy." He said the JCVI's work was open to public scrutiny and that the committee would consider Dr Jefferson's research. Dr Douglas Fleming, director of the Royal College of GPs' Flu Unit, said: "We need to support the flu vaccination programme. "There is good evidence from clinical trials that flu and its more serious effects are prevented by vaccination when you look at the community effect."